Please join us for our Annual Community Passover Seder this Saturday! 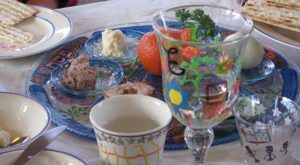 Saturday, March 31, 2018, 5:00 p.m.
(No Friday services this week—enjoy your seders at home! )Bring your friends and family to our fun, meaningful, and exciting Passover seder! Children and friends from the wider community are welcome. Reservations are required. E-mail seder@temv.org immediately. We ask that each family bring one or two food items (to serve 8 to 10 people total). Please also let us know if you are willing to help with table setting and seder plate preparation! Rabbi Sparr is available for office hours by appointment only this week; appointments must be made in advance by contacting her at rabbi@temv.org, or during business hours at 508-736-5555. In an emergency or urgent need, do phone at any hour. Sunday, April 8, 2018, 9:00 a.m.
Join Rabbi Sparr to learn service leading basics. If you’ve got some basic knowledge of Hebrew reading and familiarity with the Shabbat evening prayers, you, too, can lead a Shabbat evening service. Rabbi Sparr will explain the core outline of the service structure and provide opportunities for each member to practice outlining a service and receive coaching while leading a small section. Sunday, April 29, 10:00 a.m.
We will begin to prepare the Temple building for whatever may be next for it. Our focus this Sunday will be an initial clean up of the Principal’s office downstairs. If there are enough people we may also begin to clean up another area. There will be tasks for all ages and abilities. Please reserve this time to help our Temple community. We will release a full schedule for the day later.